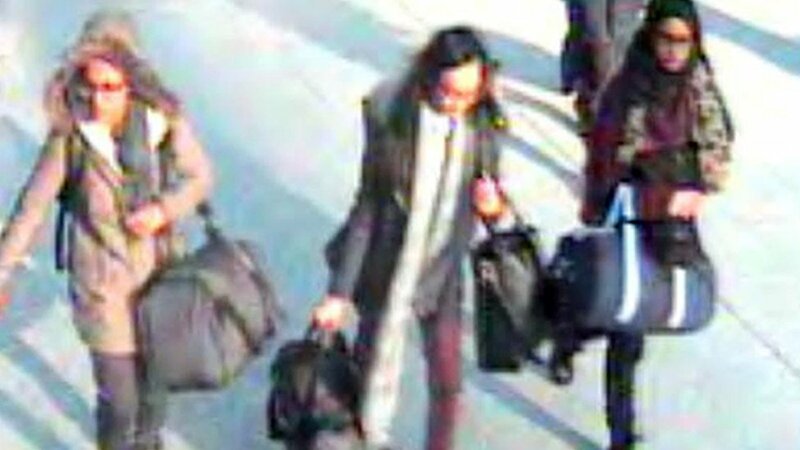 There was widespread shock when three British schoolgirls left east London in 2015 to join the Islamic State terror group. Now one of them has said she wants to come home. Speaking to the Times from a refugee camp in Syria, Shamima Begum, now 19 and nine months pregnant, said she had no regrets about going there, but had already lost two children and desperately wanted to return to the UK for her third. Describing her life in Raqqa – once the stronghold of IS – as the wife of a fighter, she talked about seeing “beheaded heads” in bins, but insisted sights like that did not faze her. The “oppression”, though, had come as a “shock”. One of the other two schoolgirls, Ms Begum said, had died in a bombing. The fate of the third girl is unclear. The UK government says anyone who returns from IS can expect to be investigated by police. IS has lost control of most of the territory it once held, but fighting continues in north-east Syria. US President Donald Trump has said total defeat is imminent – here we look at how close that claim is to reality. MPs will debate and vote later on the next steps in the Brexit process. It’s not the big, so-called “meaningful vote” on whether Theresa May’s deal is acceptable, but it still matters. The prime minister wants MPs to vote for her motion and, in doing so, pledge their support for her ongoing efforts to get Brussels to budge. But it’s not that simple. Her own backbench Brexiteers say they won’t back her motion because its wording effectively rules out no-deal and they believe that removes much of the UK’s leverage with the EU. Several other MPs have also tabled their own alternative plans – amendments – designed to change the direction of the process. One from the Labour front bench would, if passed, force the government to hold a substantive Commons vote on its Brexit plan by the end of the month. Labour has its own difficulties though, as Laura Kuenssberg writes, and is potentially facing a party breakaway. You should know your cholesterol and blood pressure as well as you know your bank Pin code. That’s the message from 40 health organisations who want more people to take up free NHS health checks, which are available to everyone over 40. The numbers can indicate early signs of cardiovascular disease, which can lead to heart attacks and strokes. Doctors should also identify and treat at-risk patients better, the organisations argue, and they want everyone over 30 to find out their heart age. Read our story to find out why that matters. Can Elizabeth Warren capture the White House? The Massachusetts senator has been a favourite of the progressive left for more than a decade. Can she translate her policy knowledge and popularity with the liberal grassroots into presidential campaign success? In a crowded field, it may not be easy. Her centrepiece policy, at least so far, is a 2% tax on the wealth of households worth more than $50m, rising to 3% on portfolios over $1bn. She said it was an “ultra-millionaire tax to make sure rich people start doing their part for the country that helped make them rich”. Away from the Times’s striking lead, several papers lead on Brexit-related matters. The Financial Times speaks to the Dutch prime minister who says his country has benefited from businesses relocating there from what he calls a “diminished” Britain. The Guardian, meanwhile, thinks Jeremy Corbyn faces up to 10 resignations from his front bench if he fails to support a fresh bid to put Theresa May’s deal to a referendum. Elsewhere, the Daily Telegraph reports that the most senior family court judge in England and Wales has asked the government to review the ability of transgender men to access fertility treatment. And the Duchess of Cornwall has spoken to the Daily Mail about the dangers of what she calls “ridiculous” diets, in particular the celebrity-inspired “fad” for dairy-free and “clean-eating” regimes.